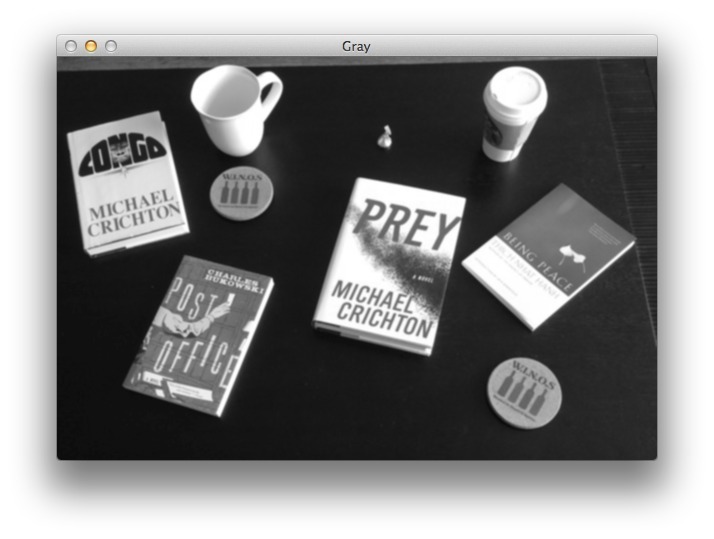 A guide to finding books in images using Python and OpenCV. This is a guest post by Adrian Rosebrock from PyImageSearch.com, a blog all about computer vision, image processing, and building image search engines. It seems strange, doesn’t it? How reading often can dramatically improve your writing ability. Reading authors that like you can actually engrain their vernacular into your own writing style. And eventually, with enough practice, you can develop a style and voice of your own. All that said, between the PyImageSearch blog, my book Practical Python and OpenCV, and PyImageSearch Gurus (a computer vision course I’m developing), I write (and read) a lot. There will be moments when I’m literally walking down the street, coffee in hand, when a stroke of inspiration will strike me like a bolt of lightning. And less I let the fleeting thought disappear into the abyss of my subconscious, I have to stop in the middle of my walk, pull out my iPhone, and compose a blog post on my tiny screen and hard-to-use keyboard. Is it a bit annoying at times? Yes but. But it’s a lot of fun. Both reading and writing are a passion of mine – and one passion fuels the other. So it should come as no surprise that my coffee table is covered in books right now. As I’m sitting here looking at my coffee table, I decided, hey, why not create a Python script to count the number of books on my table? That would be pretty cool, right? I could merge two of my passions – books and computer vision. And when Yasoob invited me to do a guest post, I couldn’t help but accept. In the rest of this blog post I will show you how to create a Python script to count the number of books in an image using OpenCV. 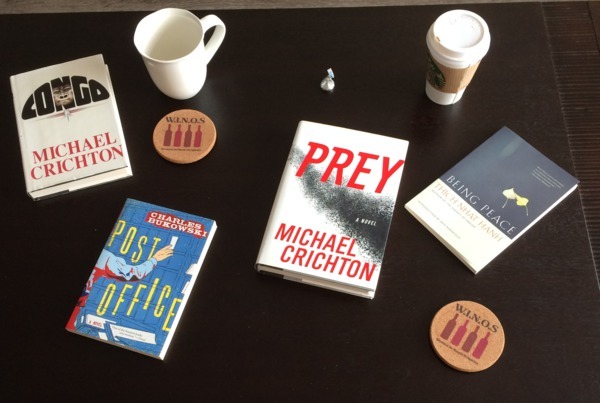 We see there are four books in the image, along with various “distractors” such as a coffee mug, a Starbucks cup, multiple coasters, and a piece of candy. Our goal here is to find the four books in the image while ignoring the distractors. What libraries will we need? NumPy to facilitate numerical operations. OpenCV to handle computer vision and image processing. Make sure you have these libraries installed! Finding books in images using Python and OpenCV. We’ll start by importing our required libraries. We’ll be using NumPy for numerical processing and cv2 for our OpenCV bindings. Loading an image off disk is handled by the cv2.imread function. Here we are simply loading our image off disk, followed by converting it from the Red, Green, Blue (RGB) color space to grayscale. We’ll also blur the image slightly to reduce high frequency noise and increase the accuracy of our code used to find books later in this post. 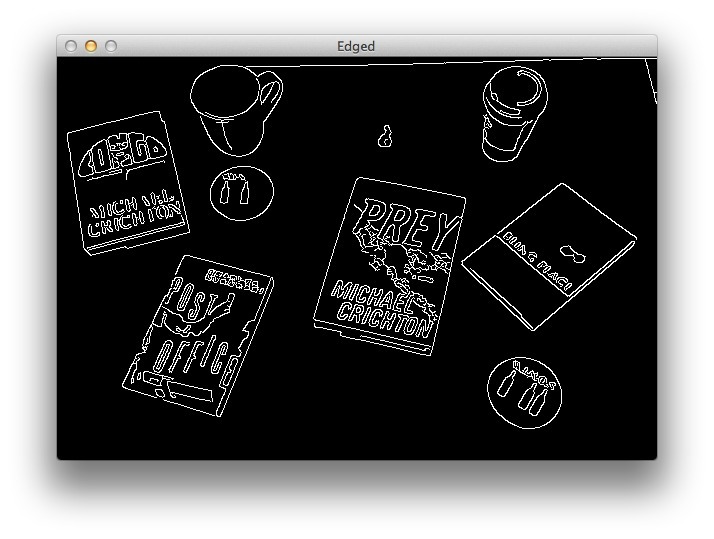 Here you can see that we have loaded the image off disk, converted it to grayscale, and blurred it slightly. We have clearly found the outlines of the objects in the images. However, you’ll notice that some of the outlines are not “clean” and complete. There are gaps in between the outlines that we need to close in order to successfully detect our books. Let’s take a second and consider the geometry of a book. A book is a rectangle. And a rectangle has four vertices. Therefore, if we examine a contour and find that it has four vertices, then we can assume it is a book and not one of the distractors in the image. This code block is where all the magic happens. For each of the contours we compute the perimeter using cv2.arcLength and then approximate the contour using cv2.approxPolyDP. The reason we approximate the contour is because the outline may not be a perfect rectangle. Due to noise when the photo was captured or shadows in the image, it is possible (and even very likely) that the book will not have exactly four vertices. By approximating the contour we can ensure we are able to side-step this problem. Lastly, we make a check to see if the approximated contour does indeed have four vertices. If it does, then we draw the contour surrounding the book and then increment the total number of books counter. In this blog post you learned how to find books in images using simple image processing and computer vision techniques with Python and OpenCV. Load the image from disk and convert it to grayscale. Apply the Canny edge detector to detect edges (i.e. outlines) of the objects in the image. Apply a closing morphological operation to close any gaps in the outlines. Find the contours of the objects in the image. Apply contour approximation to determine if the contour was a rectangle, and thus a book. I hope you enjoyed this blog post! And a big thanks to Yasoob for giving me this opportunity! If you’re interested in learning more about myself and computer vision, check out the PyImageSearch blog. We are only scratching the surface of what we can do with computer vision and image processing. Finding contours is just the start. If you’re interested in learning how to detect faces in images, track objects in video, or handwriting recognition, take a look at my book, Practical Python and OpenCV. Yasoob has written a review about one of my courses as well. To download the source code and example images used in this article, use this link. Guys I hope that you enjoyed this interesting intro to image processing in Python and OpenCV. I am sure that there would be more posts like this in future. If you have any comments and feedback do comment below. See you till next time. Reblogged this on What a Computational Biologist Do?.